This past year I have read many books and the greater majority of them were on my Kindle. Without my Kindle I think …. no, I know…. that I would have stacks of books all over the place (more than I do now). Here are some of the best books that I’ve read this year. To me books are an escape from the every day life, it’s a way to travel the world, experience new and exciting things, and a way to stretch my imagination beyond it’s limits. I can get lost in a book for days and days…. barely stopping to do much else when it’s an amazing book. I love when an author can spin a story in a way that grabs your attention and pulls you in so deeply that you can’t set the book down. My Kindle was one of my favorite Christmas gifts aside from my Kitchen Aid stand mixer. Now you have the chance to win one of them to have for your very own! I along with several other amazing friends have teamed up to bring you the Comforts of Home giveaway and there are three amazing prizes. All you have to do is enter using the Rafflecopter below and if you win the Kindle let’s compare favorite books! The “Comforts of Home” giveaway begins Monday Dec 2 and ends at 12:00 AM on Monday, December 9, 2013. Giveaway is open to U.S. residents only. Void where prohibited. All entries are optional with the exception of leaving a blog comment. We will never sell, distribute, or spam your email. Three winners will be chosen by Rafflecopter (powered by Random.org). The first person chosen will choose between a KitchenAid Artisan Stand Mixer, Keurig K65 Brewing System, or Kindle Paperwhite. The second person chosen will chose between the two remaining prizes. The third person chosen will receive the remaining prize. This is a non-sponsored post. Prizes were purchased by a group of participating bloggers. 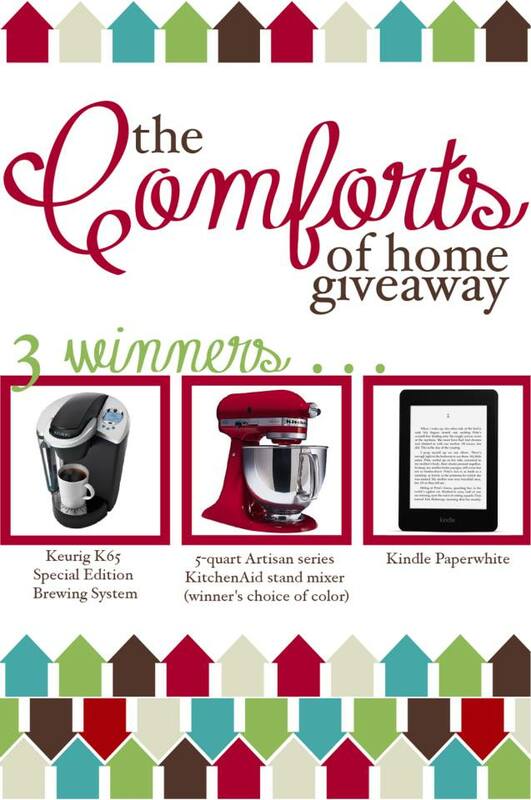 KitchenAid, Keurig, and Kindle are not affiliated with this giveaway.